Customer Support is your go-to team for questions about your existing solar system or community solar membership. 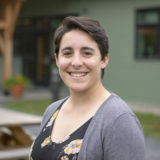 Laura grew up in California, lived in Maryland during her high school years, and later moved to Vermont to pursue a BS in Psychology at the University of Vermont. One of her first summers in Vermont was spent grassroots organizing for the Vermont Public Research Group (VPIRG) Clean Heat campaign. She instantly fell in love with Vermont’s landscape and vibrant communities. Laura went on to work full time with VPIRG as Membership Coordinator, where she honed her customer facing skills and solidified her strong passion for clean energy progress and a healthier environment for all. In 2015, Laura and her husband thru-hiked the Appalachian Trail from Georgia to Maine and went on various adventures throughout Central and South America. These experiences opened Laura’s eyes even more to the fact that our climate crisis demands worldwide action, and she’s happy to be a part of the solution by joining SunCommon and bringing solar to Vermonters and New Yorkers at an affordable cost. When Laura is not in Vermont, you can find her in New York visiting family and friends. Outside of work, you’ll spot her climbing mountains, playing ice hockey, or biking around town with her husband, Kyler.